Our range of products include center seal side gusset pouch. 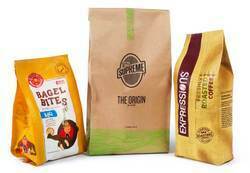 We are a trusted entity enterprise in the relevant industry, engaged in providing Centre Seal Side Gusset Pouches. The provided pouch is manufactured using superior quality raw material & advance machines keeping in pace with industrial norms. Moreover, our offered pouch is known in the market for its optimum strength and durability. In addition to this, the pouch provided by us is completely checked from our end to dispatch a defect free range.